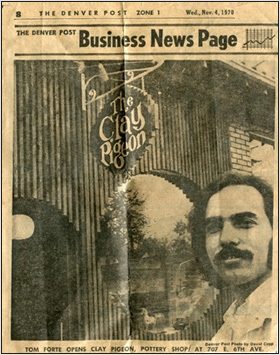 The Clay Pigeon offers unique handmade pottery traditional to the historic potter's art. Tom Forte has been making hand thrown ceramic pottery for more than 45 years in the Denver area. Creating functional and collectible pottery has been Tom's passion. 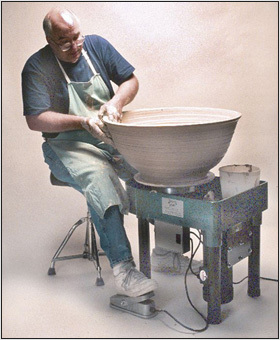 Unique, one-of-a-kind works of art are crafted using the potter's wheel, slab rollers, and extruders. The clay used in each piece varies from coarse-grained stoneware to fine delicate porcelain. He uses clay native to the Colorado region and fires in one of two large kilns he has constructed in the kiln yard at the rear of his studio. One of the kilns is fired with natural gas, the other is fired with wood and hand stoked continually for approximately 24 hours. Tom has spent his entire pottery career researching and developing traditional glazes long associated with past and present cultures such as iron-saturated Tenmokou, striking copper reds, and many versions of Celadon, such as apple green, Lung Chuan, and Kinuta, among others. Each piece is glazed and decorated by Tom and then placed in his kiln and fired for more than 24 hours to a temperature of more than 2300 degrees Fahrenheit. This high temperature makes each piece extremely durable. Tom's work, whether it be a gift or something you are adding to your collection, is a piece to be cherished. If you are interested in being included on our e-mail list, please send us an e-mail with your name and e-mail to: Info@ClayPigeon.com. We send e-mails to customers only when we have added new pieces to our website from kiln firings, or when we are planning an exhibit. To peruse pieces currently for sale, please click on a Gallery link in the navigation bar. If you are interested in any of the pieces of work on this website, please don't hesitate to fill out the order form with the specific piece. Be sure to include your best contact information. We will respond to you promptly to make arrangements for payment and shipping. If you prefer, you are welcome to meet at the studio to pick up your purchase and shop for additional work not currently on our site. We also can schedule a "facetime" shopping experience to view the many pieces available that are not currently listed on the website. We accept checks, cash, and most major credit cards. As always, we will happily pack and ship your purchase, usually within a day or two at the most. Our shipping fees are our only cost for these services. Sales tax is charged for purchases made in Colorado. Purchases shipped out of state are currently sales tax free. Thanks for visiting and feel free to give us feedback on our website or services.